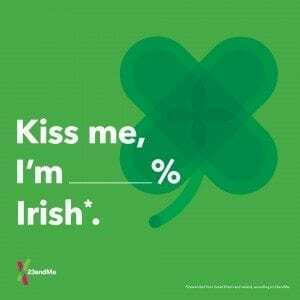 Thank your lucky clovers because almost everyone in the 23andMe database is connected to someone who is Irish, and plenty of others have at least a wee bit of Irish ancestry. 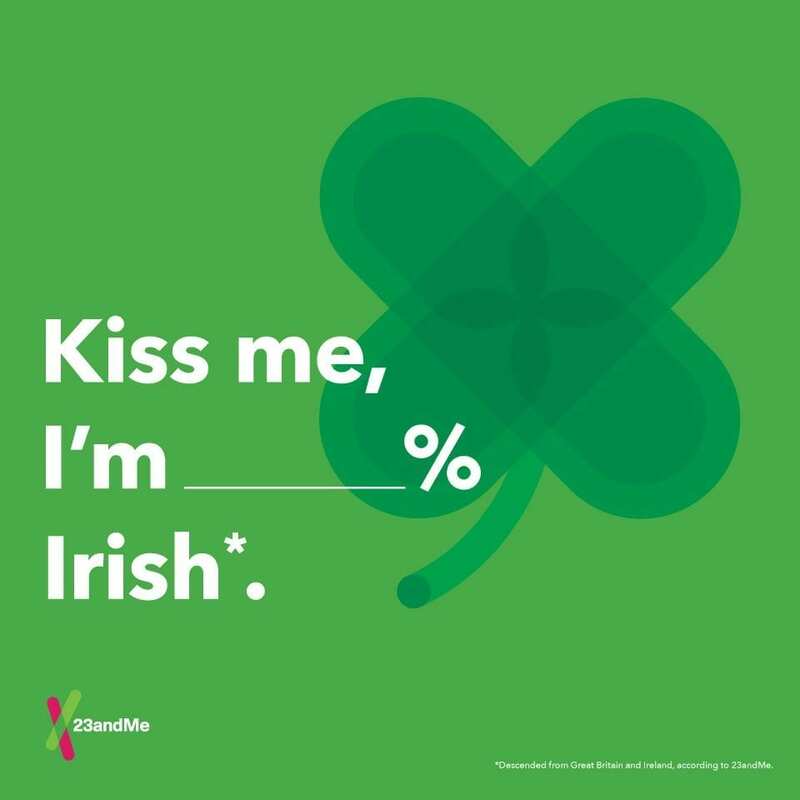 In honor of St. Patrick’s Day, 23andMe researchers looked at the aggregated and anonymous data of our customers to determine just how many had a connection, even if it was a small one, to the Emerald Isle. What we found out was that about 87 percent of our more than 600,000 customers have at least a tiny amount of ancestry that is shared with someone of confirmed Irish descent. This doesn’t mean they have Irish ancestry, but that they share ancestry with someone who is Irish. We can do this by looking at DNA segments of a certain length that are shared with people of with confirmed Irish heritage. For comparison’s sake in the US population about 11 percent of people report that they have Irish ancestry, according to the US Census. Boston has the highest concentration among U.S. cities with more than 20 percent listing themselves as Irish American. The total US population of more than 34 million people who report being Irish American dwarfs the 4.6 million people living in Ireland today. The total population of Ireland makes up only a very small fraction of all the people in the world today with Irish ancestry. Just in case you’re calling “blarney” on 23andMe’s estimates, it’s important to note a few things about how we derived our percentage. Because our researchers are looking at DNA segments that are very small – in this case about 7 centimorgans – that probably equates to a common ancestor with someone who is Irish within the last 10 to 12 generations. That’s way, way back. 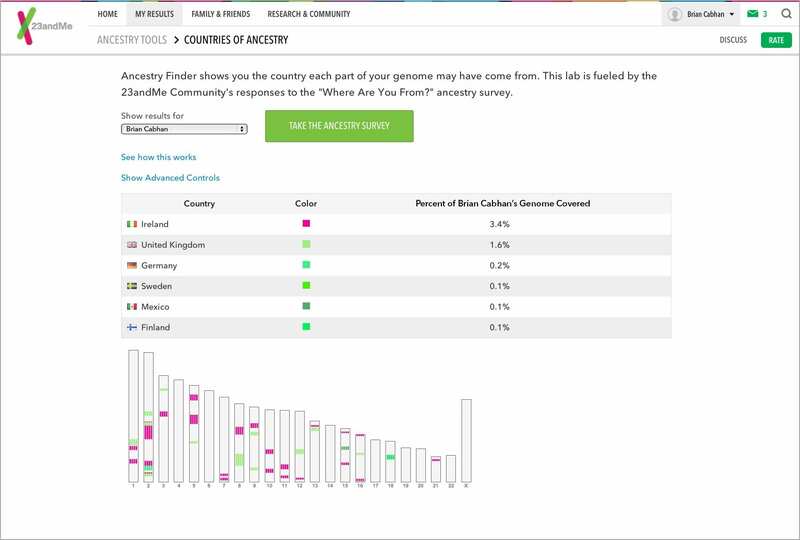 Although our Ancestry Composition tool can tell you what percentage of your DNA comes from populations around the world, breaking down the Asian, African or European ancestry. It also can give you finer detail, but the overlapping nature of DNA means that it groups Irish and British ancestry together. 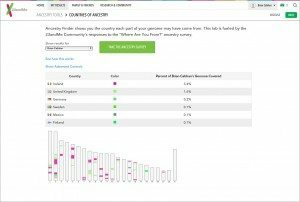 To get a better idea of Irish ancestry, customers can look at our Countries of Ancestry tool. This can show a customer DNA they have in common with other people who have confirmed ancestry from various countries, including Ireland. Our researchers used aggregated and anonymous data from all of our customers to determine what the percentage of customers who have shared segments of DNA with people who have confirmed Irish ancestry. Ultimately we think the numbers mean you don’t need to to be Irish to be connected to someone who is.